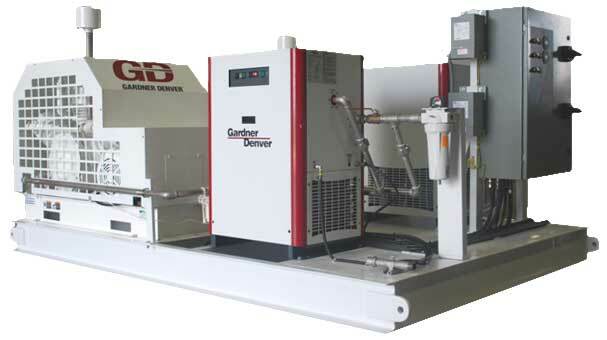 GENERON builds and delivers a Medical Air System, utilizing two Gardner Denver 15 hp, 2-stage oil-less compressors, with controls for alternating Lead / Lag operations. These compressors are mated with two Gardner Denver Refrigerated Dryers and a particulate filtration system. All components are mounted on an AWS structural steel skid, which includes stainless steel interconnecting piping and isolation valves. The control panel includes a single- point electrical connection, for simple installation by onsite personnel. This system provides for 100% redundancy in delivering clean, dry, Medical Air to the customer’s facility. GENERON and its U.S. distribution network are available to assist you with primary air compression, Instrument Air systems and Nitrogen Generators for your specific application. Please contact us with your requirements and a representative will contact you for further assistance. For further information on the GENERON group of companies and our capabilities, please contact us through our website at www.generon.com.